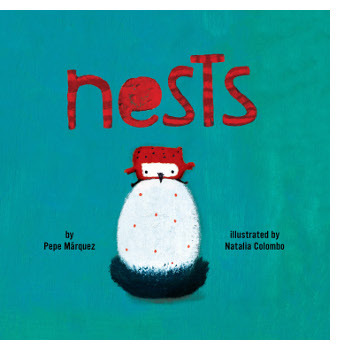 This is a story, told in a spare, no-nonsense text, about the various ways in which birds make their nests, which perhaps will prompt children to think about their own homes and those with whom they share it. 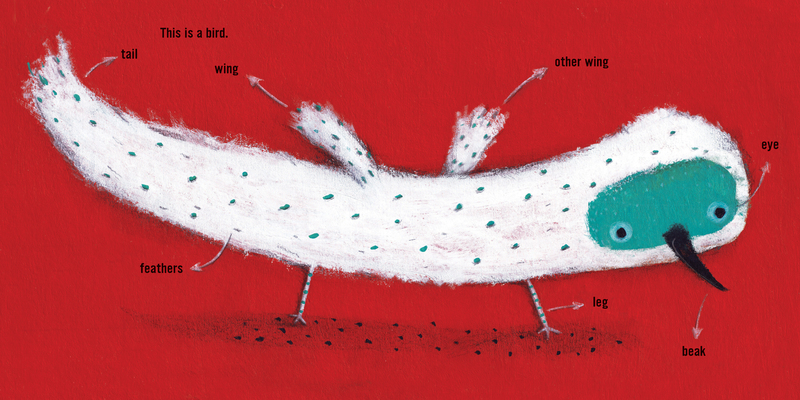 “[F]or the bird family that calls it home … it’s the best nest in the world,” we read of a family of birds that manages to make a nest in a discarded tuna can (as you can see below). Some nests may be in “dangerous places” — the mouth of a crocodile, no less, or even under the feet of people rushing by, as we see on the opening endpapers — and some are in more protected places, such as a field of cacti. But either way they are home for the birds therein. Home, after all, is wherever you lay your hat. Or, well … eggs. 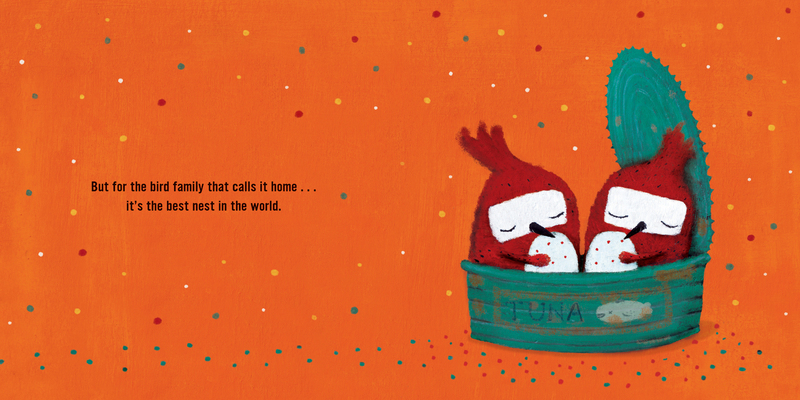 Colombo uses a palette of primarily saturated oranges and teals here, and the opening spreads (in particular) really show off her talent for drawing quirky yet endearing creatures: in the first spreads, we read about creatures who live on both land and in water before we get to the creatures of the air and their nests. In these opening spreads, some of the creatures are merely outlines and others are painted in (though these particular spreads are not featured here today); they are all for poring over and taking in all the offbeat details. 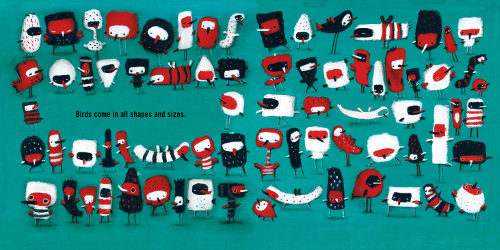 Evidently, Colombo is also a graphic designer, currently lives in Buenos Aires, and has illustrated picture books that have been published all over the world. NESTS. Edition copyright © by Kalandraka Editora, 2013. Text copyright © by Pepe Márquez, 2013. 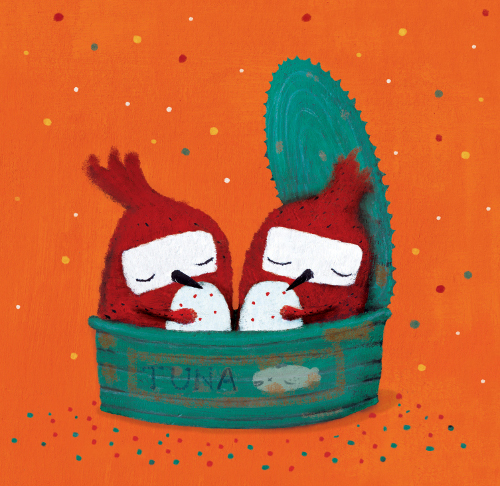 Illustrations copyright © by Natalia Colombo, 2013. Translation copyright © 2019 by Kane Press, Inc. Illustrations reproduced by permission of the publisher, StarBerry Books, New York. 1) I was sorry to hear yesterday about the death of Tomi Ungerer, but the kick is all the incredible, delightfully strange books he left behind. You can revisit this 2016 post to see some of his art. 2) An entertaining and surprising conversation this week that my co-author and I had with someone who has had a long and storied career in children’s literature. 3) I finally got around to starting Broad City, which I’ve wanted to do for yeeeears, and good god it is funny. 4) The comic that Andrea Tsurumi shared in this week’s post about her book. I want to share it with every child (and, for that matter, adult) I know. 6) Lacy M. Johnson’s The Reckonings: Essays. 7) A potluck dinner last night with some friends. Good pasta and truffles and wine were involved, as well as lots of good conversation and laughter with our daughters. Ooh, thank you for sharing Colombo’s NEST. I love the plalette and the illustrations. Jules, are potlucks with friends great? And it’s hard to believe Tomi Ungerer has passed. I loved Crictor. 3. Watching flickers flit about in trees. 4. Hummingbirds hanging out on the feeders. 6. A poem from a student. Good morning, Imps! Hello, Natalia! Thank you for sharing your art with us. Pretty colors! Jules: Your fifth kick sounds like the premise of a film – or a reality show. I like the backbeat and arrangement of that La Vie En Rose cover. Very Jimmy Eat World. Jone: Say hi to the hummingbirds for me! 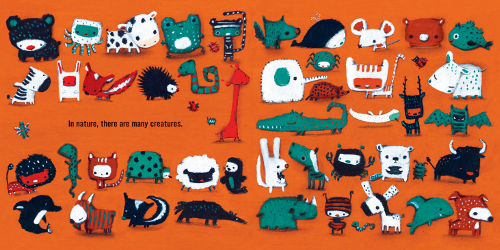 Love the color palette for this book, the orange and teal are so striking, and all the animals are so fun. Jules – What a lovely week! That comic by Andrea Tsurumi was just what I needed to see today, thank you. Your dinner party sounds like it was delightful. Jone – yay for snow! 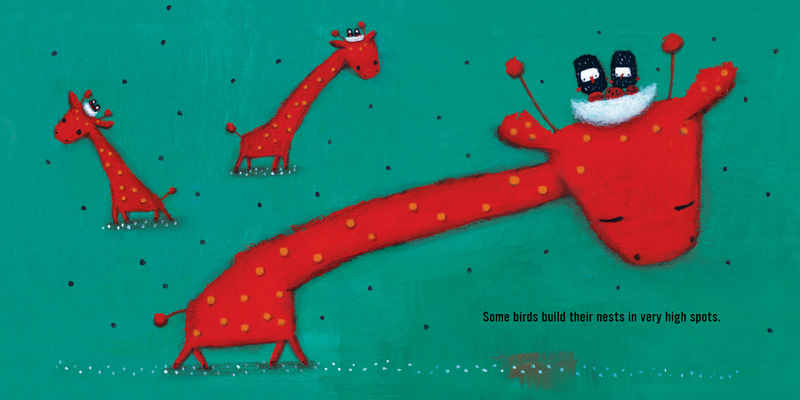 And all the birds and other fun that goes along with it. Stay warm! 2) Fire in the fireplace and Daisy snuggles. 3) Russian Doll is so so good. 4) Watched ‘Won’t You Be My Neighbor” and it was the perfect way to recharge and be warmed up on the inside. 6) The comic by Andrea Tsurumi that Jules shared – just what I needed to see after that reading essay by Emily Raboteau. 7) Looking out my window to watch one of the neighborhood feral kitties roll around in the cold sun this morning. 7.5) Planning a small Valentine’s Day get-together. Have a wonderful love-filled week Imps! Little Willow – I passed you in cyberspace! Hooray for filming and recording! Really love your kicks of time and conversations the most – two things I can never get enough of! Jone, your students are so lucky you’re eager to read their poetry. Little Willow, yes, and that is a new cover from Lucy Dacus. I love how she switches to English midway through the song. Rachel: We’ve seen about four episodes of Russian Doll, and I do love it. Thanks for the essay, which I’m marking to read later! Rachel: Hello to Daisy, and hello to the wild cats!